Check out Alecia’s beautiful smile (one of our hygienists)! Whiten your smile by up to eight shades in only an hour! Our in-office whitening procedure involves the application of a peroxide-based product and utilizes a high-intensity light or laser to enhance the whitening. The solution strength can vary from 15-35% carbamide peroxide gel and is applied several times, rinsed off and reapplied, getting teeth up to eight shades lighter in less than an hour. Take-home whitening systems can utilize the same concentration of peroxide but tend to have flavoring or fluoride added for improved taste and reduced sensitivity. For this choice, custom fit whitening trays are made, and patients are sent home with the trays, whitening gel, and instructions. Dispensing the solution into the trays and wearing them for up to 2-hours a day can get a similar result as in-office treatments, but it may take up to two weeks. Both in-office and at-home procedures are considered safe if done under the supervision of the dentist. 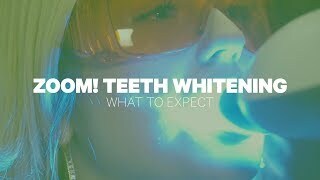 Watch our video to learn more about teeth whitening. Enjoy our top cosmetic procedure for improving the appearance of your teeth.